How many hrs on your boat? 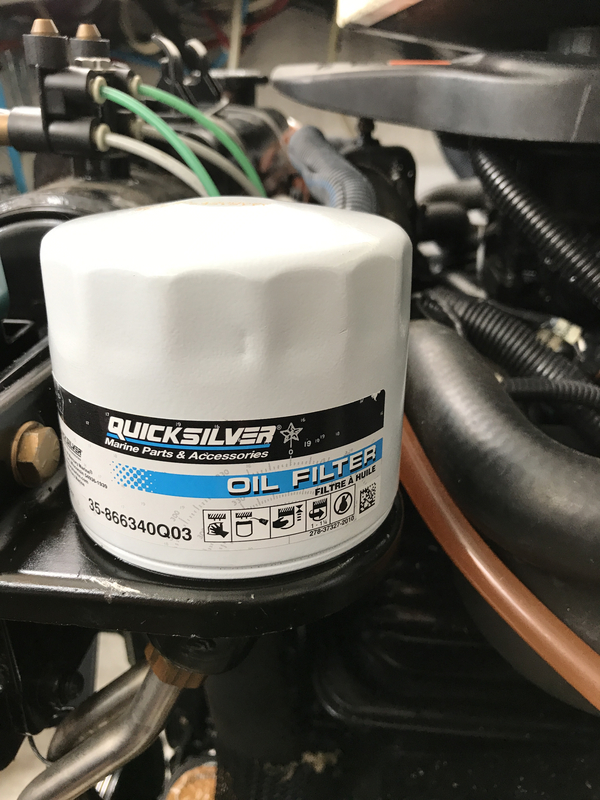 Mercury 4-Stroke FC-W SAE 25W-40 Synthetic Blend Engine Oil, is my first choice, second is, Mercury Quicksilver 25w-40 , have used both in the past, is it really necessary I don't know if it is any different than others oils. Have also used straight 50 weight Pennzoil. in the past, Never had engine problems. But now I just stick with Mercury 25w-40 oils, to be safe. I use the Merc 25w-40 Synthetic blend that Randy mentioned above. I also use the Merc High Efficiency oil filter (Part #35-858004Q). I change the oil every fall and write the engine hours and date on the filter. I just did an oil change yesterday with the Mercury 25-40 blend and Mercury filter. Have to return the fuel filter they gave me though. Need the cool fuel one. Same for me. 25-40 Synthetic Blend Merc. 335 hours 2005 342 350 horizon Merc Mobil 1 15w/50 and the merc filter. Change today. Only put 35 hours this year oil still looks new. See what at looks like in a container. I am using the standard quicksilver 25w-40 and this filter. Just changed oil and filters yesterday. Definitely going with the Wix XP filters. I've been using those for a couple of years now. Years past I've been using Mobil 1 0w-30 and my oil pressure has always been low. One motor would idle around 35, the other 25ish. At cruise, both were around 40. I decided to go to Quaker 15w-50 this time and my oil pressure is higher. Idle is 40 on one and 35 on the other. Cruise is 60 - 50 respectfully. I'm happy with that. Oh by the way, I've got around 650 hrs on my motors and the oil still looks very clean. I used Wix with my 390Hp 383 stroker. 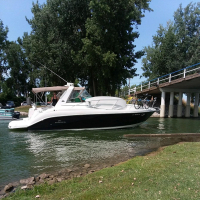 However, with my 2014 502 Magnums I was won over, after some lengthy conversations, by Mercruiser's specifically designed (not jobbed-out) High Efficiency Filter PN 858004K. Mercruiser (and techs I trust) say that its synthetic medium is superior to other brands and that the internal check valve retains oil prevent total drain down which eliminates the "water-bang" type of effect of oil under pressure hitting an empty filter and also helps prevent start-up clatter from an oil delay due to a drained-down filter. I use the same filter that @Michael T mentioned above. One thing that I do is write on the filter the hours, date and how much oil I put in the engine at the change. Thats a pretty good idea! I may start to do that. Volvo 5.7 MPI 390 hrs Rotella T6 5/40 oil Mercury Racing High Efficiency 35-881126K01 filter. Oil analysis came back very good last year with a round 50hrs on it. I put a label on the oil filters, gas filters and fuel/water separator filters with the engine hours at replacement. Also put a label on each spark arrestor cover and on the genny cover for the oil amount w/filter. My 350 MAG MPI's only take 4 wts w/filter. Anything more overfills. Sorry to bring back an old thread but I’m having issues finding T6 10-40 anywhere, only 5-40. Is 5-40 okay to use? 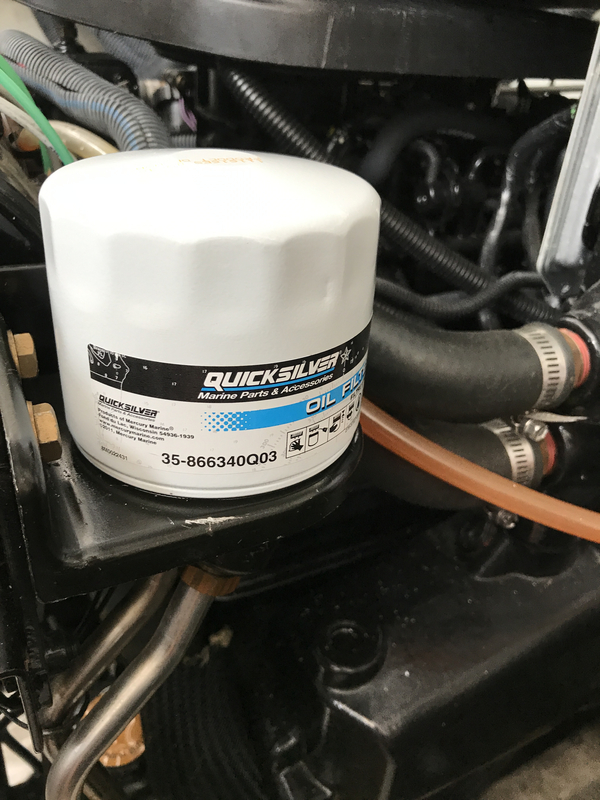 Pretty sure my mechanic is using Quicksilver 25-40. 5w-40 and 25w-40 are the same weight. 40 weight. the W implies the weight in winter service on start-up and is a compound oil. at one time compounds were considered inferior to straight oils, and due to the fact they sheared to whatever weight the base oil was (not 40, but depending on the derivative/class of oil used in the base such as dino in a group 1-3, or ether found exclusively in a group 5). bearing clearances. if you're being told to run 50w it's a good idea to do so. the shear weight of the oil comes into play, and it's importance can't be ignored. shear is described in this case as the ability to cling to hard parts- the gap in the bearing cap is designed to hold a certain amount of oil to provide 'padding' to the moving parts. in a perfect world, the metal never touches but instead rides on that skin of oil... if you run lighter oil or an oil without the ability to cling (shear) to the metals, you're going to wear parts much quicker. also, the weight comes into play while considering the type of hydraulic lifter used... lighter oils prefer lifters with tiny ports, so it doesn't drain down too fast if at all on a resting engine. some lifters designed for heavier oils will have a bow tie shaped port that exchanges oil quickly when the engine runs, but doesn't bleed down too fast when the engine stops (preparing/protecting for restart). there is a lot that goes into oils. the easiest way out is to use what's recommended. .....as well the appropriate oils can resist the huge temperature spikes that can occur sporadically in an engine and will uphold lubricity whereas an inferior (less appropriate) oil for the application will vaporize and leave metal to metal contact. .....and the more often an oil is heated to hot performance levels the more likely it is to shift to its lowest base viscosity. .....as 212 states use the oil recommended for your application.